Last month marked twenty years since I hooked up with himself and I meant to write about it, but the longer I am with him the harder it gets to write about us. Honestly, it feels like tempting fate; like every smug newspaper columnist and relationship coach in America who gives insufferable lectures on How To Keep The Spark Alive and you loathe them so much you just assume that their significant other is planning to elope with their dance instructor and you hope the two of them will be happy. This morning, flying home from Seattle and listening to Panic! at the Disco’s “Casual Affair” approximately one billion times while reading a particularly devastating chapter of the epic Steve/Bucky love story, I realized one reason why it feels so risky to write about it: it was staggeringly dumb luck on my part. Obviously I was cute as a button at 25 but I was also, in Grant’s memorable phrase, an emotional basket case. And he was being diplomatic as hell when he said it. Stupid, infinitely improbable dumb luck. Really. What were the chances that anyone would want to take me on, all of me, me and my intensity and my endless garbage-pile of trauma? What were the chances that a person would not only be able to cope with all of that, would sign up for my total lack of self-knowledge or emotional intelligence, but would be able follow me as I ran, as I zig-zagged across the Anglosphere, as I fucked up and bottomed out and rebuilt everything every few years? Would sit with me in the middle of the giant messes I made and coax me to laugh? I know everyone thinks their boo is the one in a zillion but I also know, I know in my bones, how broken I was and how hard I made things for myself and everyone around me. And to wake up here in middle age with him, with the universe of shared jokes and shorthand so enormous that it makes Claire furious that she will never learn all the stories, never know all the references, with the still-unbelievable truth that however difficult it has been, however difficult I have been and still am, he still wants me, he still misses me when I’m away… eh. Words fail me. I hope he and his tennis coach will be very happy together. Despite my best efforts, I will probably never be much good at riding. The numbers are against me. 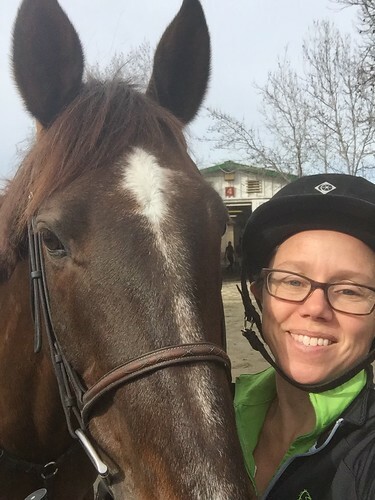 For something like equitation, the ten thousand hours thing is legit, and though I’ve ridden as much as I possibly can for the last seven years, “as much as I possibly can” is at best three times a week. I’ve added maybe a thousand hours to my childhood total of maybe another thousand and a half. If I maintain the same course and speed I’ll clock up ten thousand in fifty years, when I am 95. If I retire at 65 and spend ten years riding ten hours a week, I’ll get there by 75. So, longshot. Also working against me is my conformation, long-bodied and short-legged, which had the significant advantage of being effortlessly good at birthing a couple of ferociously healthy little girls, but is entirely the wrong way round for looking elegant on a horse. My trademark seat is my torso swaying like a poplar even as I struggle to get my meaty peasant calves around Sam’s ribs. And still. And still. I’ve been riding Sam for a quarter of a year, and I’ve learned how he likes to be asked to come round, and how sensitive he can be to the pressure of my leg. Sit on him holding the buckle of the reins and flex one ankle down; he steps away. I’ve learned to love the softness in his poll, the sparkle and flow of his impulsion. I’ve learned to ask more of him and of myself, because he is far and away the best-trained and best-natured horse I’ve ever had. I’ve learned to see our distance and sit on the saddle and wait and count our strides into the fence and tuck in my elbows as we go over, just as he tucks his knees. Today in the indoor, Laura raised the fences, and a man on a big bay went around, the bay horse snorting and blowing. And Laura said, “Now you, Rachel.” And I knew how the jumps would ride, and I knew Sam was engaged and in front of my leg and cheerful and willing and game. And around we went, pop, pop, pop, as if it were easy. These are the only compliments on my riding that really matter: the trainer putting up the fences, and my little brown horse being happy. With the rain after the drought, the hills are exuding mad chlorophyll with everything they’ve got. It’s wall to wall wildflowers around here. It rained again this afternoon and as I drove up 280 after riding Sam, the clouds and the fog in the valleys made the vivid green hills of Woodside look like Irish countryside. The red-tailed hawks are very fat and happy.